S&P 500 Hits 2009 Projection Target – Resistance or Springboard? 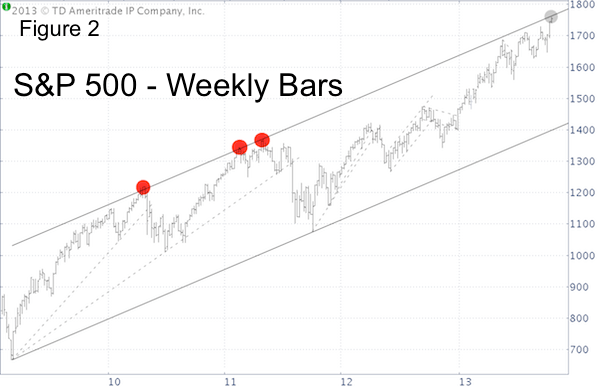 The S&P 500 has finally reached its up side target outlined by a trend channel going all the way back to 2009. Is this the bull market’s final destination or just a ‘layover’ before departing for new bull market highs? The S&P 500 (SNP: ^GSPC) has rallied 100 points in the last 10 days. That’s nice trivia, but the weekly S&P 500 bar chart (figure 2) shows something more significant. The S&P 500 (NYSEArca: SPY) has finally reached trend channel resistance going all the way back to the March 2009 low. This trend channel served as a natural magnet for prices, that’s why the Profit Radar Report has been following the channel since early 2013. 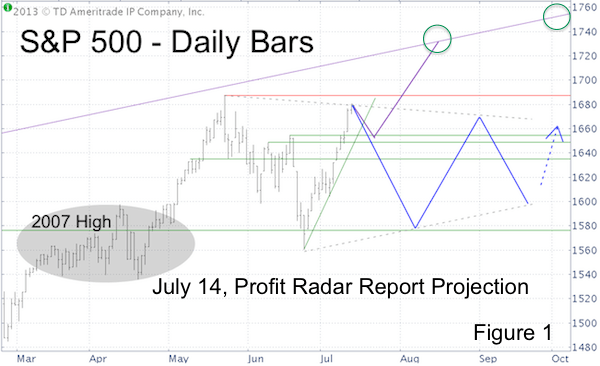 The July 14, Profit Radar Report featured two possible paths the S&P 500 could take to ultimately reach the channel. The S&P 500 (NYSEArca: IVV) chose option #2, the cat and mouse path. But regardless of the path, the destination has been reached. What now? The S&P 500 has captured the long-standing Profit Radar Report’s up side target and accomplished this mission. As the chart shows, the upper line of the trend channel has acted as natural resistance for the S&P 500 (NYSEArca: VOO) in the past and repelled stocks. But past performance is no guarantee of future results. If the S&P 500 is going to reverse, it should do so right around trend channel resistance. In fact, the effect of the channel resistance is being felt today. However, I am seeing a number of indicators that suggest any reversal will be only temporary in nature, with the growing potential of higher price targets. One indicator that suggests continued (although not uninterrupted) strength for the S&P 500 is VIX (Chicago Options: ^VIX) seasonality. In fact, VIX seasonality is quite pronounced. As always, I will share my findings and buy/sell signals via the Profit Radar Report. Guess what! The S&P 500 now trades above 1,700. Should I dare ask, why did the S&P 500 (NYSEArca: SPY) pop above 1,700? As every Grandma and kindergarten kid will tell you, it’s because of what Bernanke said on Wednesday post FOMC address. This may well be, there’s no denying that the Fed has fueled the stock market, but there’s another – possibly even better – explanation for the pop. 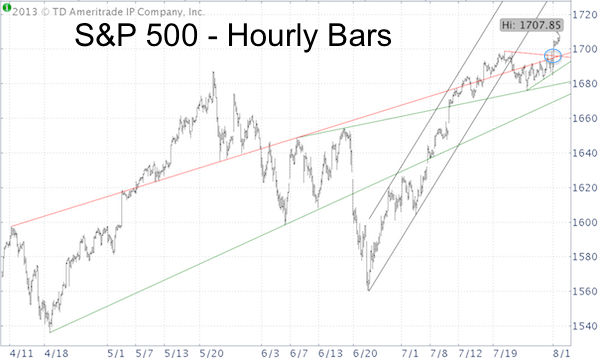 The S&P 500 chart below was initially published in the Wednesday edition of the Profit Radar Report and reveals something not commonly addressed by the mainstream media. No, it’s not the fact that stocks didn’t pop the trading day after Bernanke’s speech. The chart shows that price action was contained by two red trend lines that acted as resistance. Why and how do trend lines work? This may be a corny illustration, but resistance levels contain stocks like a fence contains a lion. If the fence is broken the lion dashes out. Like a freed lion, the S&P 500 (NYSEArca: IVV) dashed higher as soon as ‘the fence’ (double trend line) was broken. This hourly chart evidences that short-term trend lines work quite well. Just because resistance was broken doesn’t mean a rally will continue indefinitely. Quite often the S&P (NYSEArca: VOO) will come back down to test support (prior resistance) before moving higher or it will run into a new resistance level. What’s the Next Target or Resistance? To discover higher resistance levels, we need to zoom out and look at a daily or weekly chart. 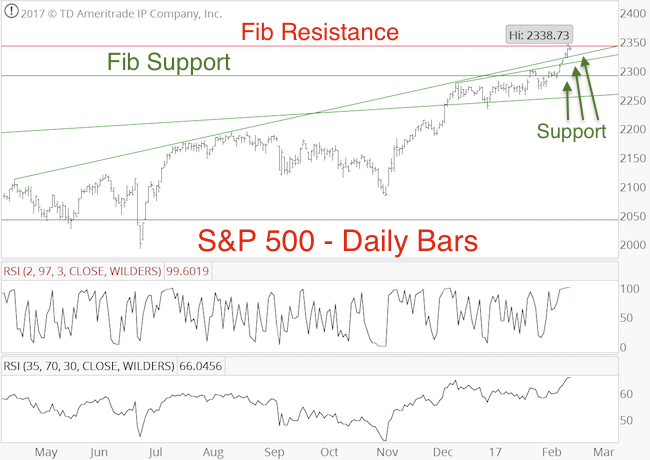 The Profit Radar Report, a premier resource for S&P 500 technical analysis, has already identified the next strong resistance and target level for this rally. It’s too early to tell for sure, but the upcoming resistance should be important as stocks run the risk of declining significantly once resistance is reached. 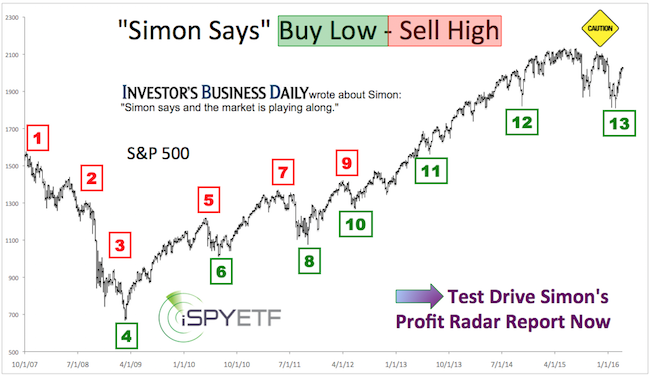 You may check out the Profit Radar Report or take a look at this free do-it-yourself paper on S&P 500 technical analysis.